Martin Van Buren. Photograph by Matthew Brady. Metropolitan Museum of Art/Wikipedia. Presidents throughout American history have inadvertently embarrassed themselves from time to time. Gerald Ford’s unplanned trip down the wet, rainy steps of Air Force One. George W. Bush’s bicycle mishap on his Texas ranch. His dad, George H. W. Bush, accidentally vomited on the Japanese prime minister after a questionable helping of sushi. While most of these modern incidents routinely receive recognition by presidential history buffs and comedic television sketches, one incident along a stretch of the National Road brought presidential accidents to Indiana. 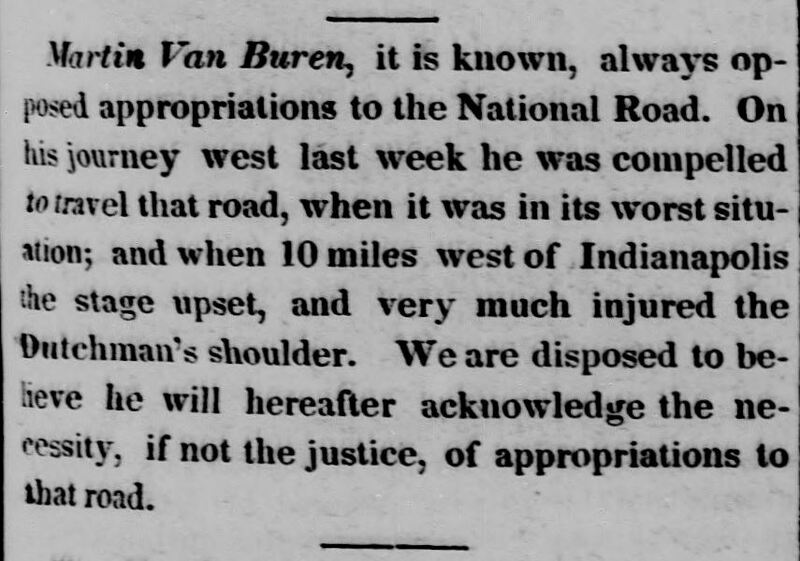 Wabash Courier, June 18, 1842. Hoosier State Chronicles. 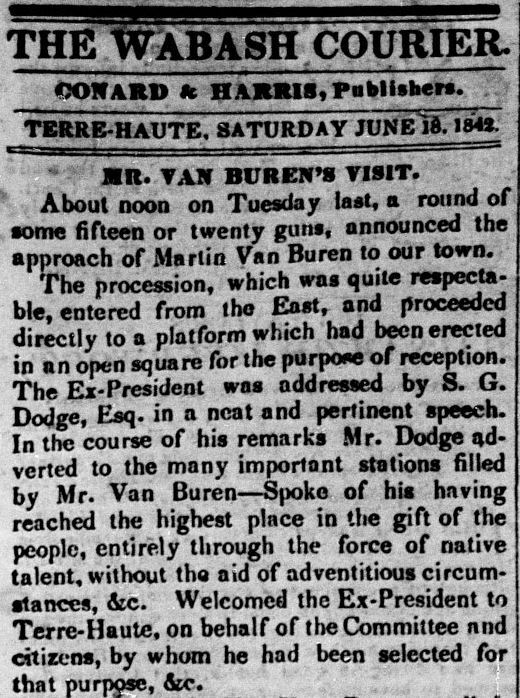 Martin Van Buren, eighth President of the United States (1837-1841) and successor to political powerhouse Andrew Jackson, traveled through Indiana in June of 1842. 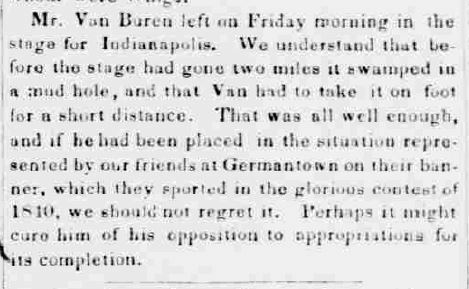 Nearly a year out from his one term in the White House, Van Buren hoped that traveling across the US might increase his future political prospects. During his trip to Indiana, he visited Terre Haute, Putnamville, Indianapolis, and Richmond. However, Van Buren’s future presidential aspirations went into the mud—literally. Brookville Indiana American, June 24, 1842. Hoosier State Chronicles. 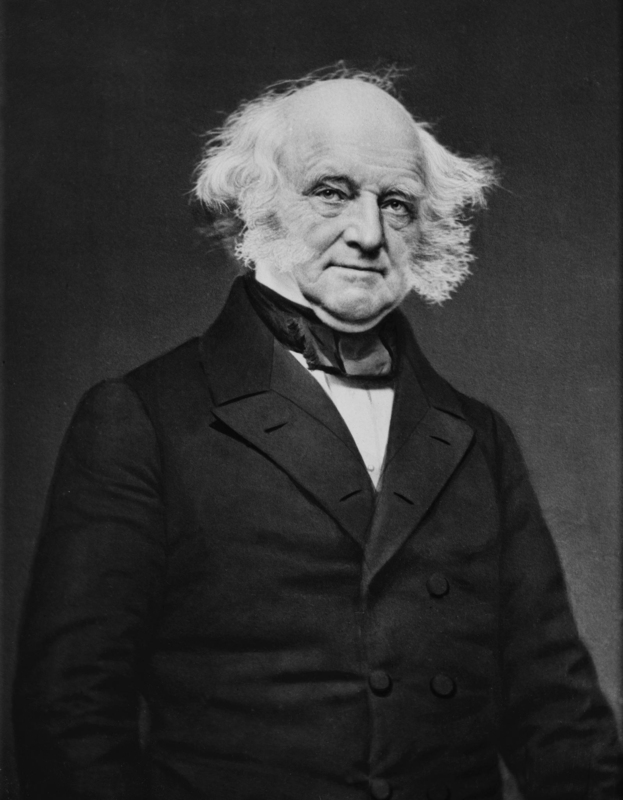 Martin Van Buren, it is known, always opposed appropriations to the National Road. On his journey west last week he was compelled to travel that road, when it was in its worst situation; and when 10 miles west of Indianapolis the stage upset, and very much injured the Dutchman’s shoulder. We are disposed to believe he will hereafter acknowledge the necessity, if not the justice, of appropriations to that road. Indiana State Sentinel, June 21, 1842. Hoosier State Chronicles. Panel Boot Victoria carriage, circa 1840s. Ellwood House Visitor Center, DeKalb, Illinois. Wikimedia Foundation/Pinterest. 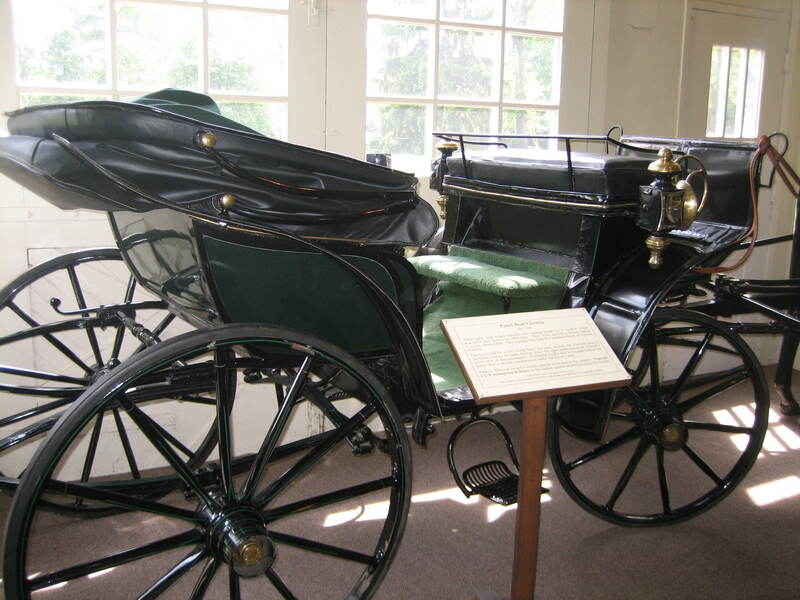 While this is not the exact carriage the Van Buren used, it is indicative of a type of carriage that he might have used. The report is of the carriage coming down that hill and gaining speed and gaining speed and then hitting the tree roots here and tipping over. . . .
At the base of the tree was a large mud hole where pigs wallowed. There were two routes to get around it, but the carriage driver deliberately took the rough route knowing the elm’s roots would overturn the carriage and send Van Buren flying into the mud. The plan was executed perfectly. The carriage tipped over, and Van Buren went into the muck, soiling his starched white clothes and filling his boots with thick mud. Richmond Palladium, June 18, 1842. Hoosier State Chronicles (Forthcoming). That night a mysterious chap partially sawed the underside of the doubletree crossbar of the stage that Van Buren and his party were to travel west in so that it would snap on the first hard pull… When Mr. Van Buren left on Friday morning for Indianapolis, before the stage had gone two miles it was swamped in a mud hole and he had to take it on foot. Despite the apocryphal nature of the story’s details, the tree’s legendary status nonetheless encouraged the community to install a marker nearby. 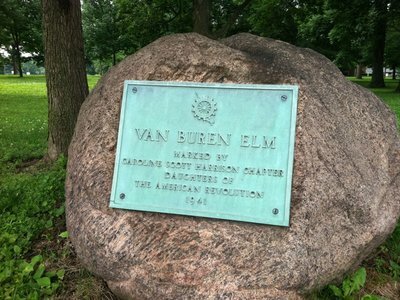 Van Buren Elm Marker, Plainfield, Indiana. Sara Wittmeyer; NPR. Martin Van Buren’s fall on the National Road, 175 years on, still receives historical note on the town of Plainfield’s website, a short article from the aforementioned Morrisson-Reeves Library, and on the NPR airwaves. As such, presidential embarrassments live on in the pages of historic newspapers as well as in the quirky ways that the public remembers it decades after the fact. Who would have thought a fall could solicit this much attention?